I few days ago I created and installed all the required bits to control the way water enters and exits my growbed. All this is probably overkill as a lot of people get away with just dumping water at one end, and draining from the other, but there's a fair chance that at some stage down the track I might try to make this system ultra low energy, so I thought I'd design it so the water can move very freely through the browbed, and so it doesn't leave any areas that don't get enough flow. If I go low energy, that might mean low flow, so I designed it to what I think is the best way I could. The plan is to have the water enter into a submerged pipe at one end of the bed that has a lot of holes in it, and exit via a similar, submerged pipe at the other end. This way the water will enter and exit evenly throughout the width of the growbed ensuring that no corners are left to go stagnant. With high flow, this wouldn't normally be a concern, but I wanted to make sure I had lots of options for the future. After a bit of experimentation I discovered the quickest and easiest way to make holes in PVC pipe for water flow was with an angle grinder. Just a normal metal cutting blade does a pretty clean job of cutting a lot of slots in a 90mm PVC pipe. Just tap it onto the PVC quickly and it works a treat. A one second cut is perfect. Three seconds will burn it. Slots are a must when using the clay balls for media as if you drilled holes, the balls would block them all. All sized balls will block all sized holes regardless. The end result looks like this and only takes around 5 minutes per meter at most. I cleaned it up with a little sand paper and added end caps and an elbow. I cut a hole with a hole saw so that I could add a stand pipe that would go through the elbow, then continue on through the growbed. There's no great need to make these joins exact because you want water to seep in all through this bit of kit. I found some fittings that for some reason have a tapered thread. When I got them home, I found that the things they screw into don't, which is kind of strange. The original idea was to cut a hole through the growbed, and screw the two pieces together from either side to lock the fittings on tight. Because of the taper, I ended up just making the hole in the growbed really tight, and screwing the fitting in really hard so it cut it's own thread into the growbed. This is what the finished drain looks like. This will drain water from the growbed back to the sump. 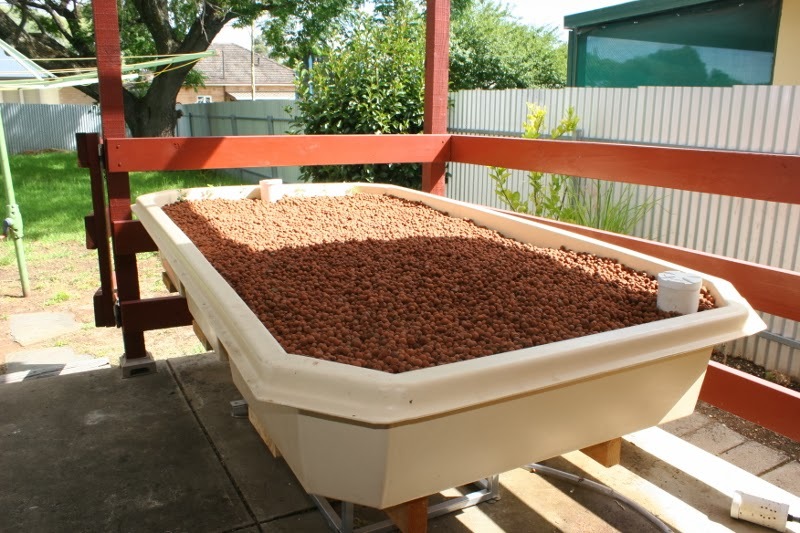 A pipe will be fit into the recess at the bottom, so that even though the water enters the drain from the bottom of the growbed, the water will exit the device at a bit lower than the top of the growbed. I cut a hole with my hole saw into the bottom of the growbed. This is an oddly scary thing to do. Shiny new water tight containers don't lend themselves to be holed without causing some distress to the new owner. I cut the hole slightly smaller than it needed to be, and then hand filed the rest so I could be sure of a very tight fit for the threaded component. Once coaxed through the hole in the growbed, the standpipe was cut to size, and pressed into place without any glue. There's no need to glue it because if it leaks, water wont actually leave the system, and there might come a day when I want to adjust the level, or change the system from constant flood to an auto siphon or something. The drain assembly looked like this when fitted. The standpipe runs through the growbed on the left hand side. The other end was completed in a similar manner, but this time with a central inlet because there was already a hole in that position. This is where water will enter the system from the fishtank. The growbed part of the system is complete. It's worth adding plastic caps top the top of the inlet and outlet media guards to keep the clay balls from getting in when your digging around in the garden. Like I said, it's probably overkill to make the inlet and outlet pipes like I did here, but it should make it just that little bit more efficient. 120 Things In 20 Years isn't above pretending to make a new growbed when really I made it more than a week ago. Long story short... I don't think that cutting PVC pipe with an angle grinder is a good idea. I'm no chemist but i know that burning PVC releases toxic dioxin gas see http://www.burningman.com/preparation/event_survival/toxic.html#.U5mhi_mSySo. Angle grinders essentially scold their way through materials, so it stands to reason that angle grinding PVC should release dioxins. It is a little more time consuming, but i find that a standard panel saw works well for cutting PVC. You can also use a miter saw. These saws cut, instead of scold, their way through materials so i recon they are a safer option. Also, if you need slotted PVC pipe, you can buy it of the shelf. Dioxin gas sounds like no fun at all.